Resin Firefighter/Fireman ornament; 4" Resin Black Bear Fireman Ornament. He has a hat with a #1 on it. He is wearing a yellow jacket with black stripes. 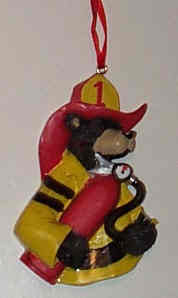 He is holding a fire extinguisher in his ha..
Resin Firefighter/Fireman ornament; 4" Resin Black Bear Fireman Ornament. He has a hat with a #1 on it. He is wearing a yellow jacket with black stripes. He is holding a fire extinguisher in his hands. This makes a great gift for that special fireman in your life. We can even personalize it for you. Please specify when ordering.